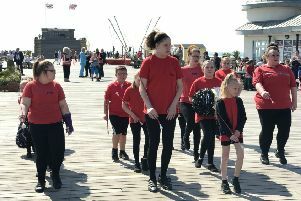 The hugely popular Hastings beach Concert is set to return in August with a new home on the Stade. Although being wound up after last year a few local traders and residents decided it was just too good an event to loose and have got together under the umbrella of High Street Traders to turn things around and keep the concert going. As always it launches the start of Old Town Carnival Week on Saturday August 1 and Sunday 2. Jackie Pratt, who is helping to organise the event, said: “A slight change this year is that it is being held on The Stade Open Space as the area of beach that has traditionally been used is occupied by the contractors who are resurfacing the Winch Road. “ However, this has meant that a professional stage can be used for the first time and it gives the opportunity to create a festival site with some astroturf to sit on and a level surface so some seating can also be provided. “There won’t be enough to go round so why not bring along a rug or your own deckchairs to sit on so you can grab a spot and make yourselves comfy for the afternoon. “The times are Saturday 2pm to 8pm and Sunday 2pm to 7pm with the gates being open from 1pm. A BBQ and licenced bar (courtesy of The FILO) are provided on site, with all profits from these going to the charities. For safety reasons neither alcohol or dogs can be brought on to the site. “It is a free event to raise money for the Hastings RNLI and also for the Sea Cadets and Pett Level Rescue. There will be collections on site and around the town all over the weekend so please give generously to the collectors wearing the official yellow t-shirts. Commemorative t-shirts are once again available this year for £9.95 and are on sale now from Cobblers to the Old Town, The Jenny Lind and The Hastings Arms. Bands and artists playing include Sam Calver, Doctor Savage, Cajun Dawgs and the Blues Brothers Show.